The City of Chestermere is giving local families an opportunity for their children to leave a legacy in the community. On Sept. 26 at 6:30 p.m., families can plant a tree on the canal pathway to celebrate the birth of a new child in Chestermere’s annual Birth Forest. 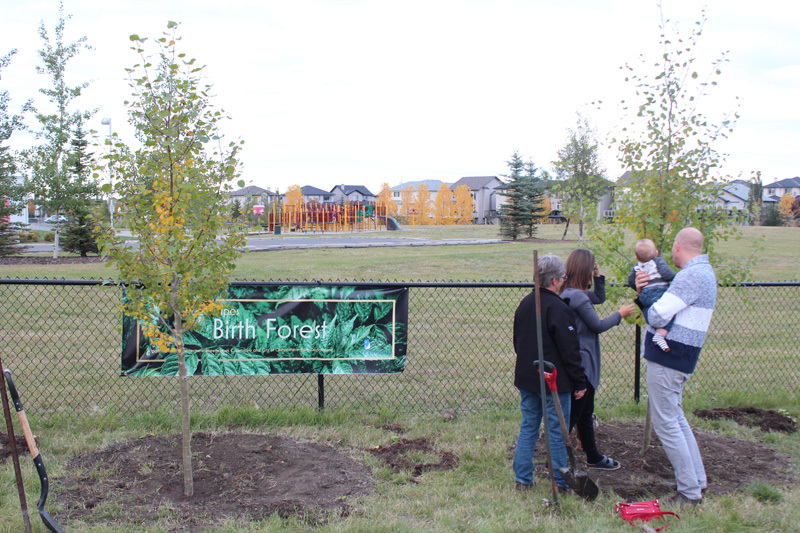 “Registering a new child born during the calendar year is not necessarily a strict policy, anyone who wants to sign up to plant a tree for a child can,” said Chestermere’s Lead Hand of the Parks Department Alison Ciupa. “Parents just show up with their children,” Ciupa added. “We do a small presentation to discuss the history of the Birth Forest, and why trees are important for the environment, and then after we have juice and cookies,” she said. She explained that, “We have pre-dug holes, families are just filling the holes with soil. “We made it quite easy, there’s not a lot of hard work involved,” Ciupa added, the trees are tagged with the child’s name. All the families are required to do is help to plant the trees, and after the city parks department waters the trees on a regular basis, she said. The Birth Forest location changes each year depending on the need for trees in a certain area in Chestermere. Ciupa said that the canal was chosen this year to be a planting site because the city wants to bring more trees and more life to the canal pathway. There are many aspects that determine what type of tree will be planted during the Birth Forest, such as the number of families registered, which is usually from 15 to 25 families, and the size of the planting site Ciupa said. Throughout the years, the city of Chestermere has planted a variety of trees including fruit trees, and trembling aspens, said Ciupa. Ciupa added, she has not yet decided on the type of tree that will be planted for this year’s Birth Forest. Not only does planting a tree for a child give that child a sense of belonging, Ciupa said, it also benefits the community greatly. Such as, cleaning the air we breathe, providing oxygen, cooling streets, helping to prevent soil erosion, providing shade, providing food, and shading areas such as lawns that are thirsty, Ciupa added. To plant a tree in Chestermere’s Birth Forest residents are asked to fill out an online registration form on the city of Chestermere’s website. A $40 registration is required and can be paid at Chestermere City Hall. For additional information regarding Chestermere’s annual Birth Forest please visit www.chestermere.ca/198/Birth-Forest.